Dubai: Dubai, which has so far become a major outlet of global fashion and accessories products, has taken a bold initiative to create a hub for design, innovation and creativity for the global fashion industry — by launching the Dubai Design District, industry observers say. His Highness Shaikh Mohammad bin Rashid Al Maktoum, Vice-President and Prime Minister of the UAE and Ruler of Dubai on Saturday announced that a new integrated facility — Dubai Design District — will be created adjacent to the Business Bay area of Dubai, dedicated to developing the Emirate’s fashion, design and luxury sectors. The district will be operated by Tecom Investments, a member of Dubai Holding, which has an impressive track record in creating, operating and growing successful, industry focused business parks in Dubai. “The implementation of a knowledge and innovation-based development strategy requires a vision, strong coordination at the top level of government, and a participatory approach to mobilise the population to back the needed reforms,” Abdul Aziz Othman Al Twaijri, Director General, Islamic Educational, Scientific and Cultural Organisation, said in a recent report. “Sustained strategic efforts are needed to obtain tangible outcomes and to anchor the new practices so that they will endure over the medium to long term. The real challenge especially for the private sector is to develop more competitiveness and identify ‘niche markets” in the global economy,” he said. Dubai Government had earlier created the region’s first knowledge clusters — Dubai Internet City, Dubai Media City, Knowledge Village, Dubai Studio City and International Media Production Zone. The creation of the Dubai Design District is a natural progression to these clusters and will help realise the government’s vision to create a world-class hub. Analysts say, Dubai might not replace Milan or Paris as the world fashion hubs, but could create a new hub — where investment is flowing in. 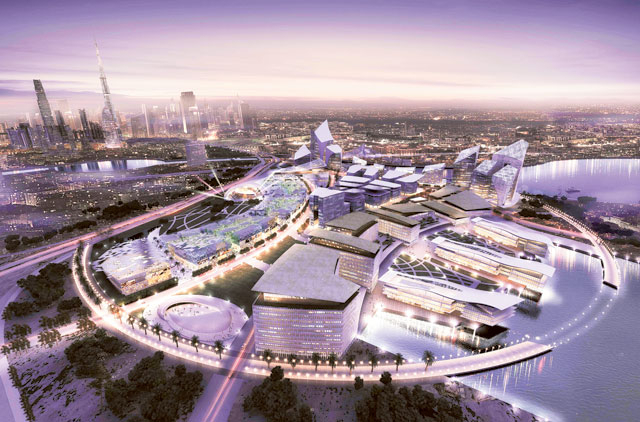 Dubai Design District will be a vital part of the process as we look to deliver against the objectives set out in our Tourism Vision 2020, and it will provide an additional key element in Dubai’s bid to host Expo 2020, it said. With this move, the emirate will now attract investment in developing creative fashion designs for the global luxury and consumer markets and will contribute to the industry’s growth. The Middle East luxury market saw growth of 10 to 15 per cent from 2011 to 2012, establishing the region as the tenth largest luxury goods market globally. Dubai sits at the heart of this achievement. “Also the move comes at the right time as the country’s economy has begun to grow with investors looking back at Dubai to invest,” Dr Maniar said. The district is expected to become a full service commercial hub for design industry-related organisations, brands, and supporting enterprises within the value chain, a statement by Dubai Government said. “It will feature a custom built creative community that will encompass purpose built commercial and retail facilities for established and emerging designers, design institutes, waterfront promenade, convention centre and event venues and related academic institutions,” it said. The UAE also holds the second position in the 2011 Apparel Index, driven by a population with a high disposable income and immense fashion consciousness. Dubai’s rapid growth in the areas of fashion, luxury and retail is typified by the success of The Dubai Mall, the world’s largest shopping and leisure destination, which welcomed 65 million visitors last year — more than the number of people who visited New York in 2012. The move is expected to contribute to Dubai’s and the regional economy by attracting investment, create employment — both direct and indirect — as well as increase value-added exports of fashion and luxury products. “So far, Dubai had been a market for consumer and high-end luxury fashion products. The move will change that. Dubai Design District will help new fashion labels emerge from here and eventually help compliment the growth in the global fashion industry — which is challenged by the European financial crisis,” Jitendra Gianchandani, Chairman of Jitendra Chartered Accountants, an investment advisory, told Gulf News. “Dubai design district will be one more feather in Dubai’s cap. So far Dubai has successfully attracted investors in various exclusive activity based free zones such as Media free zone, Internet city and Health care. Then why not fashion and design? “It will help to boost to ancillary industries in fashion, design and luxury goods in a country where more then 200 nationalities with multicultural environment share and experience fashion and luxury products,” he said.